We'll never know why David is starving himself. After several singles that weren't quite up to snuff on the dance charts, Scooter had to rethink their strategy in 2011. Their previous single, The Only One, was pretty much their largest flop to date in terms of charting position, so Scooter opted to look at the popular trends to see where to go with their future releases. Making a huge smash on the music scene at the time was dubstep, headed by electro-megamind Skrillex and his band of dubstep cronies. So, back into the studio ran the three fellows and there they cranked out a few dubstep tracks for their 2011 album, The Big Mash Up, one of which was the next single, the unusually titled "David Doesn't Eat." 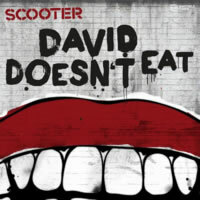 Though I'm not quite sure who David is or why he is choosing to starve himself, why I do know is that although David Doesn't Eat is a strange track, sounding very unlike Scooter, it's actually quite powerful on the ears and solid all-around, even if it is heavily influenced by others. In the Radio Edit, as the dark synth and creepy organ introduces the song, we're suddenly treated to a wild funky beat as frontman H.P. Baxxter shouts his usual nonsensical lyrics, though this time they're far more autotuned than ever before. The main chorus, with perhaps the deepest bass they've ever used, is taken from "A Walk In The Park" by The Nick Straker Band, but it works surprisingly well. Who would have guessed that an old track from the 1980s would blend so well with the grittiness of dubstep? And the C-part is genuine dubstep: randomized blips of rough synths in total chaos. Just what you'd expect. All in all, it's one of the loudest and aurally thickest songs I've heard in a while, and I am quite impressed. On the flipside is the Eric Chase Remix, which is a more straightforward house mix featuring samples from the Scooter single. There's nothing particularly noteworthy about this remix, although the use of the samples is fun for a short while before it gets repetitive. There's a "new" plucky melody here to accompany the Walk In The Park chorus, though, and it adds a bit of cheerfulness to the track. Oh, and no B-Side! What a shame. Sadly, the people have spoken, forcing this little gem even further down the charts than its predecessor. The public likes dubstep, but obviously, not from Scooter. That's a shame because this song is quite impressive once you listen a few times. After I first heard it, the chorus was stuck in my head for days, annoying my girlfriend when I simply HAD to sing it aloud incessantly. I still recommend seeking it out as it's a side of Scooter we hadn't seen before; it's also proof they are still capable of explosive tracks.